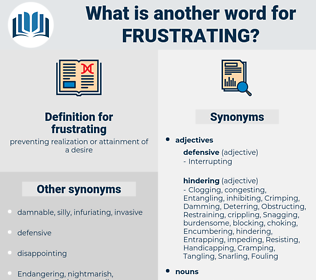 What is another word for frustrating? discouraging, upsetting, daunting, difficult, foiled, regrettable, embarrassing, Aborted, galling, appalling, irritant, boring, depressed, uncomfortable, unpleasant, onerous, sobering, burdensome, arduous, obstruct, unfortunate, sad, tiresome. forestalling, thwarting, Deterring, Counteracting, halting, countering, opposing, foiling, dashing, discouraging. disappointing, frustrated, disheartening, depressing, unsatisfactory, irritating, distressing, annoying, disappointed, disturbing, dismal, painful, tedious, disheartened, laborious.